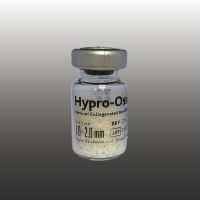 Our concept for the development of the Hypro-Oss product line was conceived with the idea of an ideal biomaterial in mind, a material with the highest biocompatibility and affinity to the new endogenous bone. In order to accomplish this purpose, we implemented our proprietary atelopeptidation and lyophilization technologies that preserve natural collagen components of bone material within bone structure after modifying the collagen to a non-immunogenic atelocollagen. This preserves the natural crystalline structure of the hydroxyapatite as well as the collagen components by completely avoiding the heating (thermo) processing method that other manufacturers still use. These characteristics allow enhanced and consistent new bone formation, and persistent integration between mature new formed bone and existing bone materials.